Carl took me out for ice cream. Then he asked me if I wanted to do donuts in a nearby strip mall's parking lot. We climbed into his car and did some, and then I grew tired of it and asked him what else he wanted to do. He said, "Donuts. 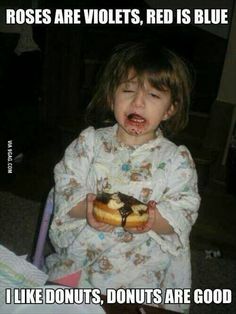 Donuts forever!" and he did more donuts. After a while longer I told him I had to pee. He said that if he let me out of the car, he'd have to stop doing donuts. I let him do a few more until I really had to go, and then he dropped me off in front of a Burger King. When I came back out, he was still doing donuts. I waited for him to come by and pick me up so that we could go do something else, but he never stopped and so I called a friend to pick me up and take me home. What kind of lawless Mad Max town do you live in? No one cared that a random car was burning tires for what must have been at least an hour? Please tell me you were in high school. I thought for sure you meant donuts. Sounds like the guy just wanted a good sugar high. ....your story telling skills are lacking.